A podcast about all things Macintosh. For Mac geeks, by Mac geeks. Episode 119. The new iPhoto for iOS seems like a great tool for image editing on the iPhone, iPod, and iPad, but I wanted to try and get the most out of it. Many of the controls are intuitive, but as we like to do here I figured it was time to take a deep dive and uncover some of the little extra things it can do. Smile – PDFPen for iPad, smilesoftware.com. A podcast about all things Macintosh. For Mac geeks, by Mac geeks. Episode 118. With the new iPad now out the device is seriously starting to transition from a content consumption device to something more and more people are using for creation. The question is, is it enough to replace your notebook? Can someone get by with an iPad as their only computer? A podcast about all things Macintosh. For Mac geeks, by Mac geeks. Show 388. Impressions of the new iPad from me and a couple of friends. Katie Floyd (Mac Power Users), Allison Sheridan (Nosillacast), Victor Cajiao (Typical Mac User), Jeff Gamet (The Mac Observer), and myself share our thoughts on Apple’s latest device. Since the new iPad unboxing would have ended up looking a lot like my iPad 2 unbox I decided to mix it up a bit and have some fun with iMovie. The new iPad arrived today and while the unboxing experience is almost identical to that of the iPad 2 I still wanted to get you some unboxing photos. I also threw in some macro shots of the new iPad’s retina display versus the display on the iPad 2. There is also a pair of photos comparing the iPad 2 camera to the one in the new iPad. A podcast about all things Macintosh. For Mac geeks, by Mac geeks. Episode 117. When Apple announced the new iPad and Apple TV last week a big part of that was support for 1080p video. In the past I’ve done episodes with Ara Derderian (HTGuys.com) on how to build Apple based home theater set-ups, but since Apple only supported 7020p that has always been the focus. Now that 1080p is here Ara and I chat with Dean Dauger (Dauger Research) about his 1080p based Mac Home Theater set-up. I don’t often cover new product releases, but this year when I asked what you wanted me to cover at Macworld the resounding answers was “anything Thunderbolt”. Unfortunately there wasn’t much Thunderbolt on the floor at Macworld but a week earlier, at CES, Elgato had announced they were bring a Thunderbolt SSD (Solid State Drive) to market soon. If you listen to the Maccast you know I am a fan of Elgato’s video products, so it was awesome when I opened my email today and got the news their new SSD drives were now shipping. Technically, according to PR, they are shipping in Europe now and in the US in about a week (see the US doesn’t ALWAYS get stuff first), but who’s splitting hairs? This is “something” Thunderbolt! 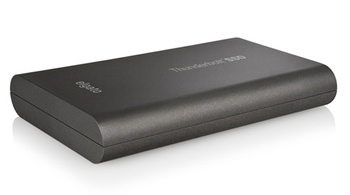 The new Elgato Thunderbolt™ SSD comes in two sizes. A 120GB version for $429.95 USD and a 240GB version for $699.95 USD. The enclosure is metal and pocketable and, since it’s SSD, there is no fan or moving parts so of course it’s completely silent. Likely though, the biggest deal about the drive is the speed. As you can imagine when you couple the performance of SSD with an advanced interface like Thunderbolt the results are amazing. According to El Ggato’s product page the Elgato Thunderbolt SSD is capable of transfer rates in the range of 270 MB/s1, more than 3 times what you could get with a typical Firewire 800 drive. If you need a portable rugged drive with the fastest possible performance on your Thunderbolt Mac Elgato looks like they have you covered.